Lydia and Julie are best friends with one goal: to crack the code of popularity. Lydia’s the bold one – an aspiring theatre star, stick-fighting enthusiast and human guinea pig. Julie’s the shy one – an observer and artist, accidental field hockey jock and faithful recorder of notes. Both of them wish they were less geeky, so they devise their own research project to figure out how to be cool. 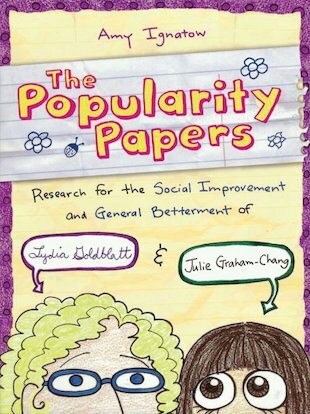 But somehow, the harder Lydia and Julie try to imitate the popular girls, the farther they get from their goal – and from each other! Chuckle along as you snoop into this hysterical research notebook and journal, containing their observations and the results of all their experiments!